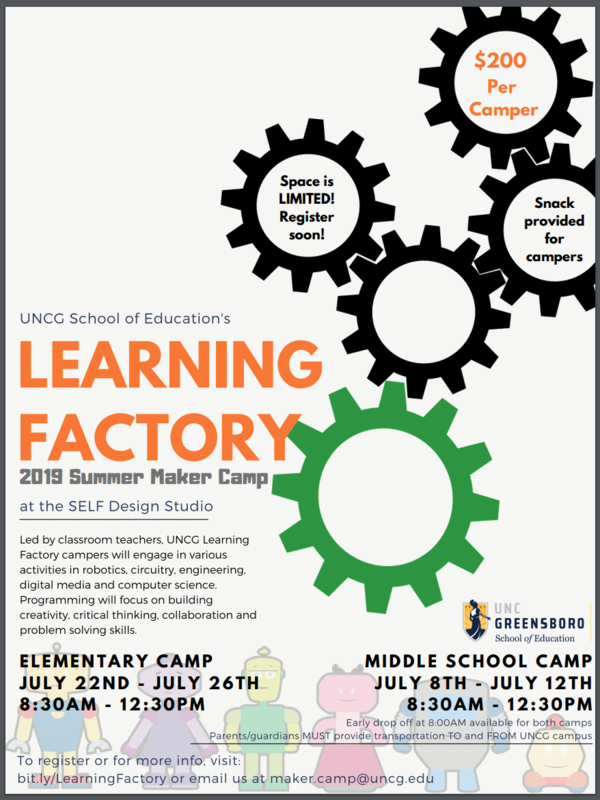 UNCG’s Learning Factory Summer Camp is a maker camp for students led by classroom teachers. Throughout the one week in the makerspace, campers will engage in various activities in robotics, circuitry, engineering, digital storytelling, and computer science. The camp program will focus on building students’ capacities to use creativity, critical thinking and problem solving skills. Click the flyer for a larger image. As we’ve learned in our Science classes, a characteristic of a living thing is that it can MOVE! But what about things that aren’t alive? Can they move too? Using some exciting new technologies, you’ll create inventions that roll, walk, hop, or jump. Your inventions can solve perplexing problems, and respond to light, sound, movement, or touch! What will you invent? You’ve stumbled upon a deep, dark cave. You venture inside and what do you find? Nothing, because unfortunately you’ve left your flashlight at home. D’oh! In this class, you might create a device that flashes lights when someone enters the room or starts moving when it hears a sound. Yes, you can, with the power of your imagination, sensors and circuitry, create a moving, buzzing, flashing sensation! Music. Beeps. Boops. Bops. Boinks. Crash. Zip. Zap. Zoiks. Noises are everywhere. Now, you’ll have the chance to create some original noises. Will you create the next digital musical masterpiece? We shall see, Beethoven, when you use Makey Makey or littleBits to build projects like musical house plants, banana pianos, singing fish bowls, or space-age sound gizmos! Lights! Camera! Action! You are the director of the greatest blockbuster in Learning Factory history when you learn to use green screen technology to create an original film masterpiece! You and your campmates will write, film, direct, produce and star in your own movie…on Mars! Or in a volcano! On the dark side of the moon! Under the ocean! Anywhere you want, with the magic of green screen! Board games, video games and smartphone apps have worked their way into almost every nook and cranny of our lives. We play them, but have you ever created one? What if we told you the power to create games was right at your fingertips? You’ll explore what it takes to create board games and video games and create your own exciting versions to share with your families and friends. Sample activities may include: building board/card games w/ 3D printed pieces, designing augmented/virtual reality games, Scratch programming, or Breakout/Escape Room style gaming. 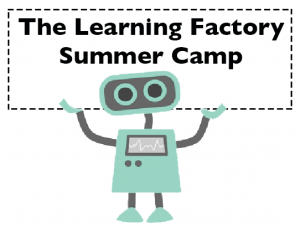 The Learning Factory Camp is filled with tons of crazy amazing awesome technology… Get ahead of the curve now and learn how to create 3D models and use a 3D printer! Or you can get back to basics and use your imagination to create a cardboard masterpiece or an amazing sculpture with your camper friends! Bow Down to the Robot Overlords! Robots are everywhere: in our homes, schools, and workplaces. It’s not a matter of if they will take over the planet, it’s really a question of WHEN. But we must act now and learn to program them, before they learn to program US! Join us for an adventure in programming robots to do your evil bidding. Learn to code and control several types of robots, including Sphero, Ollie, Dash, Cubelets, LEGO WeDo, and littleBits. Who doesn’t love art class? You get to paint, draw, sculpt, and make a (creative) mess! You’ll get to experience art at a whole new level when you combine it with coding and making. Maybe we’ll be creating digital art, art with robots, or maybe even interactive public displays of art. This class is definitely Pablo Picasso approved.